The sooner we can understand how our teeth work, the sooner we’ll realize how important it is to look after our pearly whites on a regular basis. 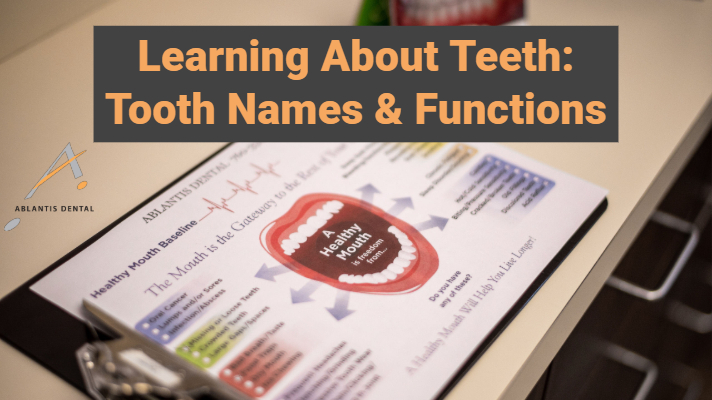 Once we’ve inherited our complete set of adult teeth, it’s our responsibility to learn about how to keep our teeth healthy. There is much more than meets the eye when it comes to our teeth, and dental professionals may need to probe beyond the surface to pinpoint the root of a dental issue. As you may already know, teeth are the strongest part of the human body. Each tooth is constructed from dense minerals which make them exceptionally durable and long-lasting. However, our teeth consist of other components which are only visible by looking at an X-ray. The crown is the top surface of the tooth which is visible to the naked eye. Our crowns are both protective and functional, helping to mash food for digestion. The way the crown is shaped dictates its tooth type. Some major dental procedures will require a crown replacement if it is necessary to drill through the enamel. Our gumline is where our teeth meets our gums. The gumline must be cleaned through daily flossing and brushing. Food can get trapped in the fine ridges around the teeth, which can lead to plaque or gingivitis. The root makes up more than half of each tooth, and is embedded underneath a thick layer of bone. Thanks to our roots, our teeth can remain securely in place without moving around our mouths while we eat or chew our food. Adult humans have 12 molars which are located the back of the mouth (6 on the top and 6 on the bottom). Our molars are wider and flatter than our other teeth, which makes them ideal for breaking down foods before swallowing. Also known as premolars, adults grow a total of 8 bicuspid teeth (4 on the top and 4 on the bottom). Bicuspids have a flat surface and function similarly to molars to help with mechanical digestion of food. Our 8 frontmost teeth (4 on the top and 4 on the bottom) are called incisors. These teeth are responsible for biting off chunks of food to be further processed down by the molars and bicuspids. Adults possess 4 canine teeth on either side of our incisor teeth (2 on the top and 2 on the bottom). Canine teeth are much more sharp and precise than our other teeth to help us tear apart dense foods like meats and fibrous vegetables. 1. Adopt a whole foods lifestyle. By limiting our consumption of sugar, fast food, and carbonated beverages, we are better able to maintain the integrity of our enamel. Strong enamels are vital in the prevention of cavities. Metal jewelry around the lips, on the tongue, or anywhere close to our teeth can quickly lead to painful chips and breaks. While our teeth are impeccably strong, a chipped tooth can cause profuse bleeding and bacterial infection. For cosmetic reasons, a chipped tooth will require a crown replacement or veneer. Emerging studies show a link between obesity and periodontal disease, which affects our gums. By combining regular exercise with a healthy eating regimen, it becomes much easier to prevent oral decay and disease. Cigarette smoke is extremely corrosive to our enamels. Since it is a gaseous substance, cigarette smoke can perforate our gumline and corrupt our enamels much more easily than food or drink. People who quit smoking will notice an immediate improvement in their oral health. This one goes without saying, but daily flossing and proper brushing is the best way to prevent oral decay and achieve a beautiful smile. Flossing is necessary to keep gingivitis at bay, while brushing must be performed at least twice daily to remove potentially harmful plaque and bacteria. Send a text to (760) 790-4754, or call (760) 334-0128 to book an appointment. You’re one conversation closer to healthier teeth! ¹ “Study Links Obesity to Higher Risk for Periodontal Disease.” Oral Health and Dental Care, www.colgate.com/en-us/oral-health/basics/threats-to-dental-health/ada-05-study-links-obesity. ² “Enamel Erosion: Causes, Treatment, and Prevention.” Healthline, Healthline Media, www.healthline.com/health/enamel-erosion. ³ “Human Teeth Dental Charts – Bradford Family Dentistry.” Bradford Family Dentistry, www.bradfordfamilydentist.ca/human-teeth-dental-charts.